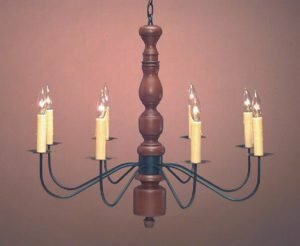 In early New England period homes Colonial Dining Room Wooden Chandeliers were the centerpiece for illumination in any room. Since trees were plentiful, craftsmen made use of this natural resource. Thus from the simplest frame homes to the most elegant estates, Colonial wooden chandeliers provided the lighting. 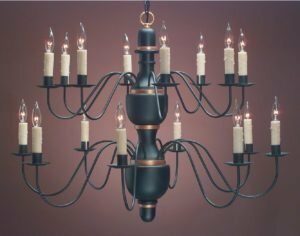 Just as in those early New England times our craftsmen can marry the beauty of turned wood with gracefully formed metal to create lighting that truly is American. The result is an heirloom chandelier.